Improper design for the grip structure will lead to inefficient operation or work injuries. The study purpose was to simulate the shape, size, and position of a gripping structure by using a 30 kg rectangular box as a heavy object, to enhance the health and comfort for an operator. Ergonomic evaluation experiments for grip structural factors were performed by samples testing and virtual simulation methods for operational tasks. Research methods and results in this study have some reference meanings and guidance for the man-machine adaptation design regarding the shape, size, and location of manual handling gripping structure of products, supplies and equipment. 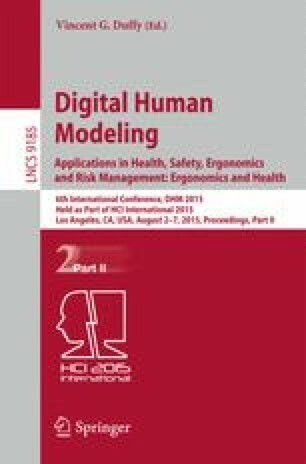 This research was supported by the National Key Technology R&D Program (2014BAK01B02,2014BAK01B04 and 2014BAK01B05), 2015 Beijing Municipal Education Commission Research Project (Title: Comfort model research of human upper limb movement), and China National Institute of Standardization through the “special funds for the basic R&D undertakings by welfare research institutions” (282014Y-3353 and 522013Y-3055).